A Chocolate Twist on Thanksgiving Tradition – This Girl Loves to Eat! I’m starting with the admission that this post is totally stolen from a recipe that comes direct from the Food Network Kitchen! It can be seen in this month’s Food Network Magazine article Thanksgiving Desserts: Pies and Beyond. Since I was very young, I have been a sucker for the smell and taste of pumpkin pie. My Aunt Lisa would bake them and the family would devour them. That was a family tradition. Since I’ve had to make them (or buy them from Marie Callender’s) myself, pumpkin pie just hasn’t been the same. 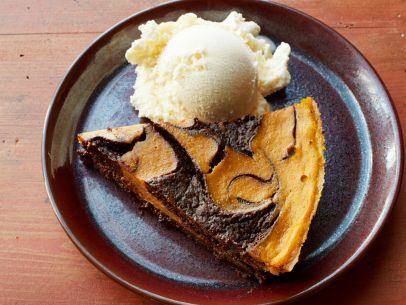 That was still the case until I saw this picture and fell in lust with Pumpkin-Brownie Swirl Pie. This pie will definitely grace my holiday table. Ok, I’ll really be keeping it all to myself to eat with day after leftovers brought home from someone else’s house, but WHATEVER. I must make this pie. I may even drizzle some hot caramel sauce over the pie AND the mandatory Vanilla ice cream. To Hell with Tradition!! Preheat the oven to 350 degrees F. Butter the bottom and side of a 9 1/2-inch deep-dish pie plate. Make the brownie filling: In a medium saucepan over medium heat, melt 1 stick unsalted butter, 1 – 12 oz package semi-sweet chocolate chips, and 2/3 cup packed light brown sugar, whisking occasionally until melted and combined thoroughly. Remove from the heat. Whisk in 2 large eggs, one at a time and then 1 teaspoon vanilla, whisking until smooth. Whisk in 1/2 cup flour, 2 tablespoons unsweetened cocoa powder, 1/2 teaspoon baking powder and 1/4 teaspoon salt until combined. Make the pumpkin filling: In a medium mixing bowl combine 1 cup pumpkin puree, 1 cup heavy cream, 1 large egg, 1/4 cup sugar,1/4 cup flour, 12 teaspoon pumpkin pie spice, and 1/4 tsp salt whisking until smooth. I only have one word for the way my mouth is watering in anticipation: Yum! Posted on November 1, 2015 November 1, 2015 by ls1228Posted in Dessert, Holidays, ThanksgivingTagged brownie, caramel, family traditions, Food Network Kitchen, Food Network Magazine, Marie Callender's, pumpkin, vanilla ice cream.